A customer changes his brand of oil and then complains of low oil pressure. So, Is this perception or reality and is low oil pressure bad ? Why don’t customers complain about high oil pressure ? 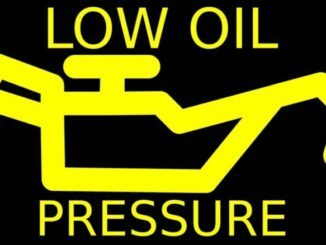 So, Having low-high oil pressure is usually affected by temperature and oil viscosity. When you start the engine, the oil is cold , so the pressure should be higher than normal. 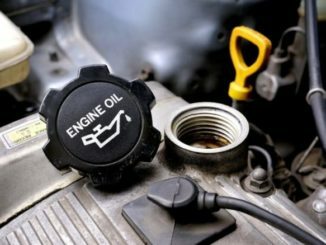 Once the engine is running, the oil is heated and flows much easier, thereby reducing the oil pressure. 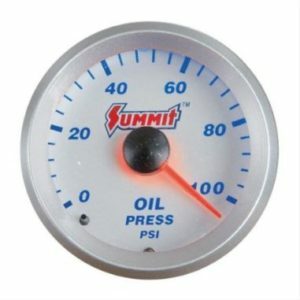 So, one of the biggest things that can affect oil pressure is temperature. As a result, multi-grade engine oils came out to even the playing field. Also, Remember that the low-high oil pressure indicated on the gauge is designed to show the effort required by the pump to move the oil. Consequently, the pressure indicated on the pressure gauge has nothing to do with the pressure between the parts in the engine. 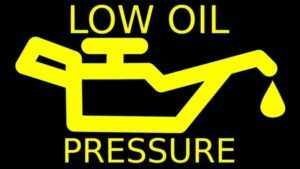 Low oil pressure is not necessarily bad….in fact it can be very beneficial within reasonable limits. High oil pressure is not necessarily good….in fact it can be a cause of great concern. Oil is sucked through the pickup screen and up the pickup tube into the oil pump. So, This pump pushes the oil through the filter and around the engine via oil galleries and oil delivery holes. Usually located downstream of the filter there is a pressure sending unit or transducer. Circulation of the oil is produced by a oil pump and not a compressor. The most important criteria for good lubrication is oil flow and not oil pressure. The oil pressure will vary considerably around the engine, declining with distance downstream from the oil pump. As a result oil pressure is negative on the suction side of the pump. Oil pressure is caused by the resistance of the oil to flow (viscosity) under the pumping action of the oil pump. With wide oil galleries and low viscosity oil, flow would be rapid and oil pressure low – a very desirable condition for minimizing wear. Conversely, under the same pumping conditions; with narrow oil galleries (by design or by blockage) and high viscosity oil, the oil flow will be slow, oil pressure will be high, hence resulting in less efficient lubrication. So, A “good” oil will be one that has viscosity characteristics sufficient to give good hydrodynamic lubrication of the loaded surfaces, yet flows around the engine well to provide a continuous supply of fresh lubricant. Furthermore in an extreme case, a very viscous oil would never get to the critical parts to do its lubrication job. Note in this case, that engines do have bypass valves to prevent excessive oil pressure in case of filter blockage. When the engine starts, all the oil is in the sump and the oil pressure is zero. The pump cannot begin to deliver oil or generate oil pressure until it has sucked up oil through the screen and the pick up tube. 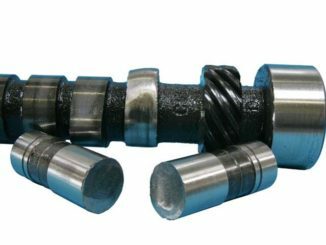 Hence, cold start lubrication is greatly assisted by having a short, wide pickup tube and oil that has very good cold flow properties. 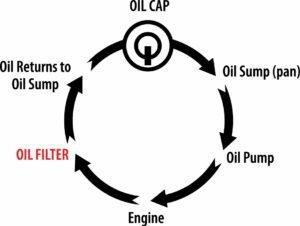 When the oil reaches the pump it is then forced through the filter and then through the engine. However, As the oil is still cold and the oil galleries are very narrow, flow is slow and a large back pressure develops so that the pressure gauge registers a dramatic pressure increase. 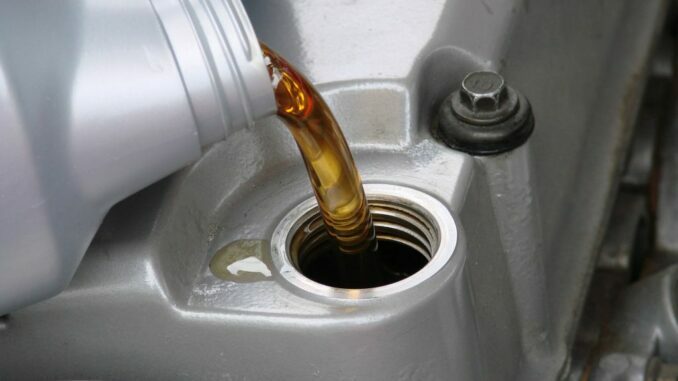 As the oil circulates and warms up, it flows faster and the oil pressure declines to a stable level. It is only at this point that the engine is being properly lubricated. Until stable oil pressure is obtained wear rates are high due to inadequate oil delivery to the wearing surfaces. So under cold start conditions, a “good” oil is one which gives stable oil pressure the fastest. 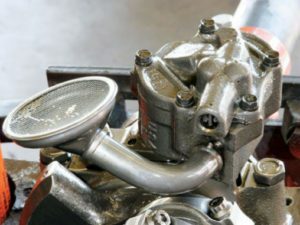 Under ideal circumstances, oil pressure should be stable and any large increase or decrease should be investigated for possible mechanical damage. Possible catastrophic engine failure – Hence top up oil level and investigate possibility of an oil leak. Possible catastrophic engine failure. Shut down the engine. Change to oil with better low temperature properties. Improve cold start-up procedures. Pump runs too slow to deliver sufficient oil. Reduces engine life. Downshift to increase rpm. Check the oil pump. Oil breakdown/engine problems; wear, deposits. Check temperature Gauge and engine temperature controls. Check oil viscosity for correct grade. Will cause engine problems. Replace pump. Engine problems. Oil flows through increased clearance more easily. Replace bearings. Higher oil consumption. Engine wear. Avoid excessive idling. Check injectors. Change oil. Old oil had a higher viscosity due to soot load and oxidation. New oil flows better. None. Oil flows adequately into the pump, but does not flow through the oil galleries. Possible catastrophic failure. Shut down engine. Use oil with better low temperature properties (5W-30 or 0W-30). Possible engine failure. Change oil and filter. Check injector performance. Avoid excessive idling. Potential engine failure. Change oil and filter. Oil flow is poor. Potential engine failure. Consult owner’s manual/oil supplier for correct viscosity grade. Change oil. 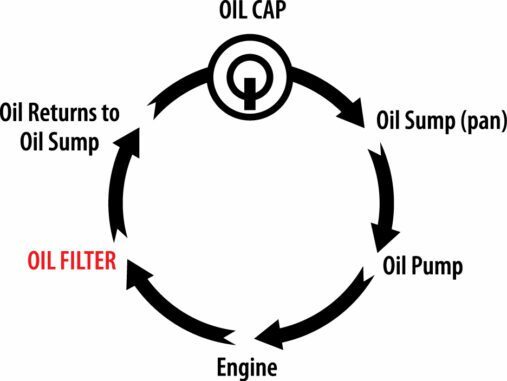 Bypass valve allows unfiltered oil to circulate – Reduces engine life. Change filter and oil. Investigate cause of blockage. Reduces engine life. Change oil and filter. Use higher quality oil. Potential engine failure. Check engine thermostat system. Check to ensure correct oil viscosity. Consequently, The customer/operator should be just as concerned with either low-high oil pressure. In fact any deviations, low or high, from “normal oil pressure” should be investigated. So, Higher oil pressure means that more work has to be done to pump the oil around the engine and this loss of efficiency should be minimized. As a result high oil pressure does not equate to good oil flow and in many cases it is an indication of the opposite. 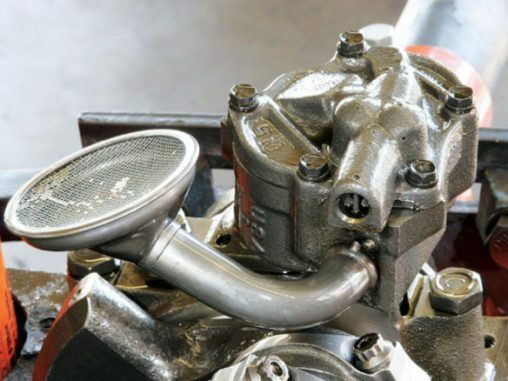 Alternatively, lower oil pressure can mean that the oil is flowing rapidly around the engine which is a very desirable condition for minimizing wear.